Such a lovely spring afternoon in Brooklyn. Christina and I hit up a few thrift stores in search of vintage goodies. Afterward I got some delicious bubble tea, totally a spring/summer staple for me. I live for days like these! Anyways, my wardrobe is in full-fledged spring mode these days. My florals and brights are out to play and excited about it. Also my mom is sending favorite pieces from Texas to join me up in NYC. Can't wait for them to arrive. Thanks Mom! You top is such a lovely colour! Perfect for Spring!! I love this look. The minty shirt is to die for. Such a pretty color scheme. Aren't moms the best?!?! I'm glad to see that your beloved florals are back in rotation. They look just lovely with this minty top! So pretty! i love the colours! super cute. I love this outfit the skirt is really beautiful, I love the mint blouse on you. Bless, your mum sounds like a right sweetheart! I love these days, when you can wear candy colors and bright pieces which perfectly go along with the weather, unfortunately here in hamburg, germany we have to wait for those days a bit longer :D greets! SUCH a perfect outfit, Bonnie! You really know how to work pastels. You look so romantic and pretty!! Love, love, love your blouse and it's collar left me speechless!! the top is so cute..i love it! What a pretty outfit! Lovely! Such a sweet, lovely outfit. You look so cute :) I adore the skirt. Mint & florals...the perfect spring combination! That blouse is so beautiful. It looks amazing with that skirt. my mom is here visiting in vancouver for two weeks! i love when she comes for a visit, she brings things I have forgotten back in ontario out west! I have yet to try bubble tea but keep walking past all these bubble tea shops in van city. i love your mint shirt with the lace bow. it's so precious. you have such a great look with your hair. very snow whiteish. love the length of the jacket! Love it! Very lovely with the mint top, the collar is great too! Love love your blouse! And your purse is yummy! It's even the color of my favorite...chocolate! That blouse is so spring perfect! Such a beautiful blouse, the collar is amazing! This outfit is really lovely! LOVE your outfit and bag! 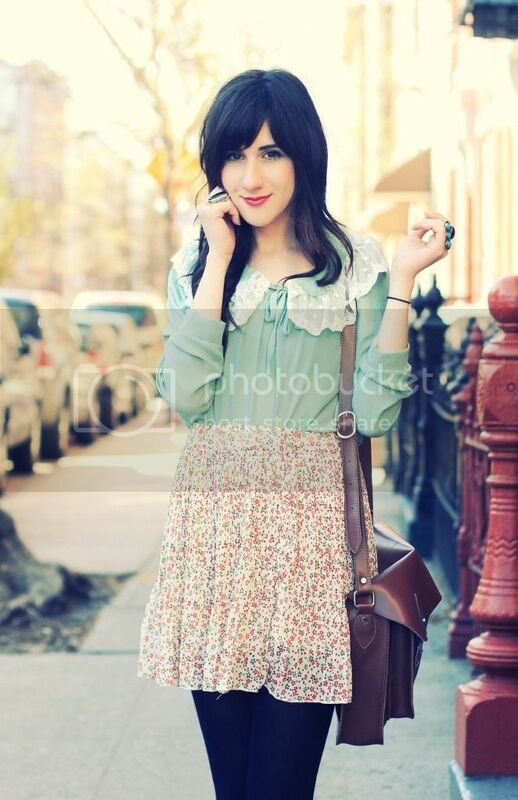 Pretty pastels honey...that peter pan collar is so dainty and perfect for spring! 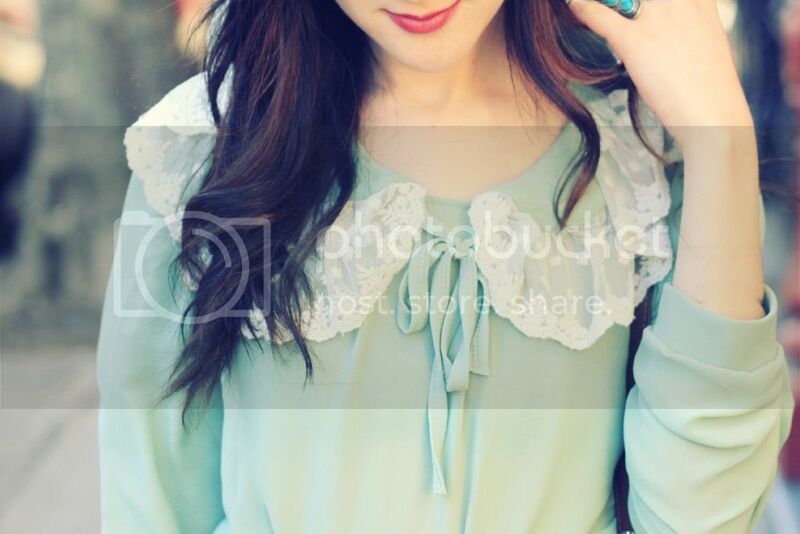 You always look so lovely, Bonnie, but your turquoise top in this post really caught my eye. I love the lace detail on the collar! Love this! that color looks great on you! Mmm bubble tea-my fave hehe! Love the gorg top. First, the collar is insanely unique and chic. Vintage looking too. The color of it is also my fave! I have been in search of mint green items lately. A mix between my obsession with pastel colors and it's got that summery vibe. i adore the mint top and the floral skirt. so darling! That blouse and skirt are adorable! I am especially drooling over the blouse. It screams Spring! You look cute as always! Tu! simpre tan dulce y tus tonos pasteles! Mint + floral = totally spring! I had never thought about that combination but definitely looks awesome! you have such a perfect style!! I always like your outfits. oooh I love this colous and clothes. Love this look color. So lovely!! I love your pretty blouse! The lace in the collar makes it more prettier! So lovely. Your outfits are always to romantically beautiful! Your blog has definitelyy improved a lot over all those years I followed you ! Definitely quite close to perfection at the moment.... no , wait , it´s probably perfect already ! where did you get that adorable top from!!! this outfit is so cute, i love your coat. can i ask where it's from? I really love the minty color of your blouse. The floral skirt is super cute with it. I love Romwe's clothes, they are all so lovely! !